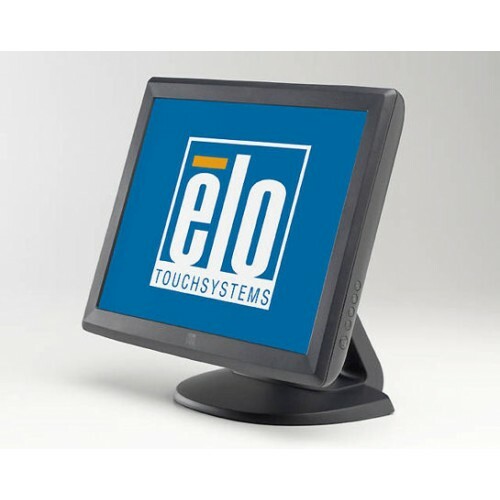 The 1515L touchmonitors are designed, developed and built to provide the most cost-effective touch solutions for system integrators and VARs. Aimed at the fast-changing retail POS and hospitality markets, they provide reliable, durable operation and come from the worldwide leader in touchmonitors, Elo Touch Solutions. The optional 3-track magnetic stripe reader (MSR), programmable to either HID or Keyboard Emulation (USB only), is easily installed by the user, providing an elegant, integrated solution and eliminating the need for external brackets or attachments. The 1515L features a choice of touchscreen technologies: AccuTouch five-wire resistive technology, the most widely used for retail applications and proven to survive splashing liquids, food and grease; IntelliTouch pure glass surface wave technology, for the ultimate in optical quality for dry retail and hospitality applications. Aspect ratio "4:3, Active matrix TFT LCD"
Useful screen area "Horizontal: 12.0"" (304 mm)\u00a0 Vertical: 9.0"" (228 mm)"
Other Supported Resolutions "1024 x 768 60, 70, 75 Hz 1024 x 768 65 Hz (Sun) 832 x 624 at 75 Hz (Mac) 800 x 600 at 56, 60, 72 or 75 Hz 720 x 400 at 70 Hz 640 x 350 70 Hz 640 x 480 60, 72, 75 Hz 640 x 480 66 Hz (Mac)"
Power supply "Internal AC, Optional external DC (power brick)"
Input voltage "AC: 100-240 VAC, 50/60 Hz DC: +12VDC \u00b15%"
Input connector "AC: IEC 60320 C6 DC: Coaxial power jack (2 mm pin diameter, 6.4 mm barrel diameter, 8.8 mm barrel length)"
Agency Approvals "North America/Worldwide: UL, cUL ,FCC, CE, Semko or Demko, VCCI, ICES, C-TICK, MPRII, Argentina S-Mark Asia: UL, cUL, FCC, CE, Semko, VCCI, IC, C-TICK, MPRII, Argentina S-Mark, BSMI, CCC, KC, China RoHS"